With SafetyGirl II you can definitely showcase your feminine side while you function in a man’s world with ease and comfort on your feet. Steel toe provide optimum safety precautions for foot and toe. Made from genuine pink nubuck leather. The toe area is designed with double leather covering for additional wear support. You can wear it all day and not experience leg fatigue because of the boots being lightweight. Features a removable foam insole providing extra comfort and helps in keeping your feet dry. There had been reports from buyers that the boots are running small based on the size chart. Make sure to order a pair that is one or half size larger to prevent a tight fit. The boots tend to be firm the first time you wear them. To soften the make and material of SafetyGirl II, you can apply an oil or leather softener all over the boots to make it more comfortable to use. Will best fir women who do not have wide feet. If your feet are wide, you can probably order a size larger. The SafetyGirl Steel Toe WaterProof Womens Work Boot is one of those pair of boots that any woman will love. These days, women have come a long way to prove that they are dependable, tough and valued assets to various professions. But just because you’re a woman working in the industrial field, does not excuse you to dress like a man. And that includes what your feet will wear. It’s really hard to know which pair and brand of boots is best and will last for a long time. There are simply numerous choices in the market. In this review, we bring out the SafetyGirl Steel Toe WaterProof Womens Work Boot, a top notch boots with high-quality features. These pink women’s work boots offers safety and comfort to women while still providing them with a hint of subtle femininity. The SafetyGirl Steel Toe Waterproof Women’s Work Boots is perfect for women who are searching for a pair of boots that’s both feminine and practical. These SafetyGirl steel toe waterproof women’s work boots is one of the best in the market today. Women can use them with ease and comfort for their activities outdoors. The boots’ sole are manmade and comprises of a nubuck upper and rubber outsole that is double in colour. They are highly long-lasting as well as shock absorbing. They also come with inner cushioning which offers stress-free foot placements and your feet will remain dry and comfortable due to its being water-resistant. Your feet and toes are well protected from any types of rolling equipment and objects because of the steel toe that gives protection to the boot’s front portion. The laces come in a customized black colour to give it a bit of edgy quality as well as a touch of attitude to the user’s appeal. These outstanding pair of pink boots is very popular amongst the female consumers. As a matter of fact, women who have purchased it have only high praises for the SafetyGirl II. The SafetyGirl II is a very appealing pair of waterproof steel toe boots that comes with a 6 inches shank height providing you with the ultimate stability and support. These women’s work boots features a compressed sole in beautiful wheat colour which is complimented by the constant braid laces. Its upper boot padding is black and comes with a similar hook catches on the upper two lacing spots. And on the side of the boots, the company’s logo is flaunted into the leather. The boots are made ideally for rough uses and are very hard-wearing to ensure it being long lasting. Any woman can wear these women’s work boots for up to 12 hours and will not feel any type of discomfort on their feet. Aside from this, they are waterproof and will provide your feet the protection they need from all kinds of injuries. WHO CAN WEAR THESE BOOTS? The SafetyGirl Steel Toe WaterProof Womens Work Boot is so attractive, it can be worn anytime and anywhere you want. It is crafted with a classic design and a timeless shape which are ideal to use with your coveralls, factory grade work outfit, company uniforms and even with a simple and comfortable pair of jeans. In addition, these work boots can even go well with your pair of summer shorts since they are quite lightweight and fashionable. SafetyGirl women’s work boots provides any wearer of it the ability to endure the toughest and roughest of environments. It brings about sustained ease throughout the working day and elsewhere. 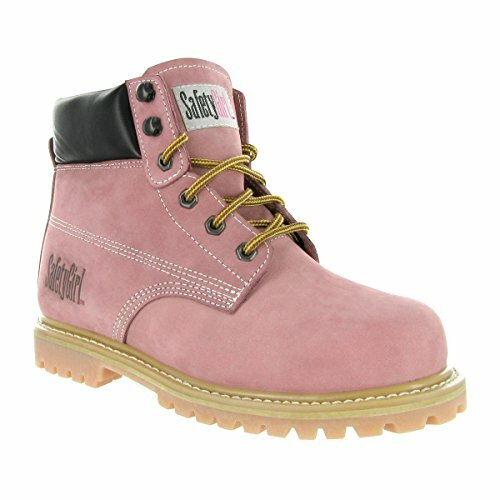 These pink women’s work boots has all the features that you are looking for and more. As mentioned above, the SafetyGirl Steel Toe WaterProof Womens Work Boot is one of the best boots available in the market today. They look amazing and can perfectly match any outfit you have in mind. They are very comfortable and durable but lightweight. The boots also comes in different colours and design combinations. The price of these attractive pink boots will not bend your budget and you can purchase it anytime online. With SafetyGirl II you can definitely showcase your feminine side. Also, you cab function in a man’s world with ease and comfort on your feet.